Packed with 425 sounds and loops, plus an array of powerful plug-ins, the MAGIX Entertainment Music Maker 2019 Premium Edition is a customizable desktop music production software that lets you easily compose, edit, mix, master, and share your songs using your computer mouse and keyboard. The Premium version offers all free sounds, features, and instruments found in Music Maker, plus a host of selectable options—three Complete Soundpool Bundles, one Soundpool Collection, eight software instruments, nine feature packs, and three preset packs. The software lets you assemble the exact sounds, instruments, and effects best suited for your personal music style, by choosing from a broad spectrum of Soundpools, Soundpool Collections, features, and software instruments directly in the integrated Music Maker Store. Lay down a basic track by dragging and dropping beats, recording bass lines and guitar melodies, or programming your own rhythms using virtual drum machines. Add synthesizer parts, grand piano chords, and record your vocals with pitch correction. For even more creative options, you can drag audio files into the Vita 2 sampler, which automatically cuts and assigns sounds to pads, allowing you to design your own instruments. As a fun alternative to conventional music production, Live Pad mode lets you use 16 virtual pads to play the specially designed live sets, just as you would with an instrument. Mix your song using built-in effects such as EQ, dynamics, modulation, delay, guitar and bass amp simulation, VariVerb II reverb, and more. Thanks to multicore support and the audio engine from the Samplitude DAW, Music Maker Premium ensures expansive high-quality audio processing. Once your mix is completed, utilize iZotope Ozone 8 Elements, automatic mastering, and the mastering suite to make final sound enhancements and ready it for distribution. 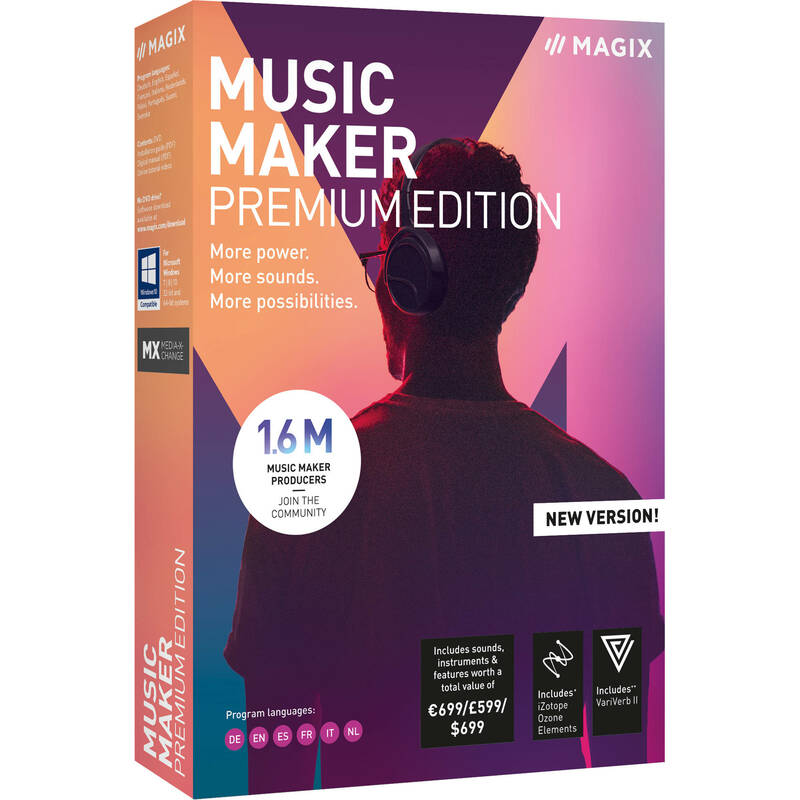 Note: This version is for one single license of Music Maker 2019 Premium Edition.